I really love oatmeal. But eating oatmeal all summer is a little ridiculous. It’s much too hot for hot cereal! That’s why I make Summertime Oatmeal. It’s a great way of enjoying oatmeal all year! Some may call this muesli. But since I’ve only had real muesli once in my life, I really can’t say if this is “muesli” or not. Cover the oats with milk. Let the oats soak up the milk overnight or at least 10 minutes. Mix in yogurt, fruit, nuts, cinnamon and extract. Add a little more milk if you want. Play with the ratios, just be sure to get plenty of fruit and nuts in there! Serve cold. Keeps for about 2 days. Beyond two days, leftovers can go into a smoothie with a little more milk and ice cubes. I made this for a nutrition class that I gave at the Reproductive Health Center last night and the ladies LOVED it! They hadn’t tried this before and thought it was a cool, new way to do oatmeal. 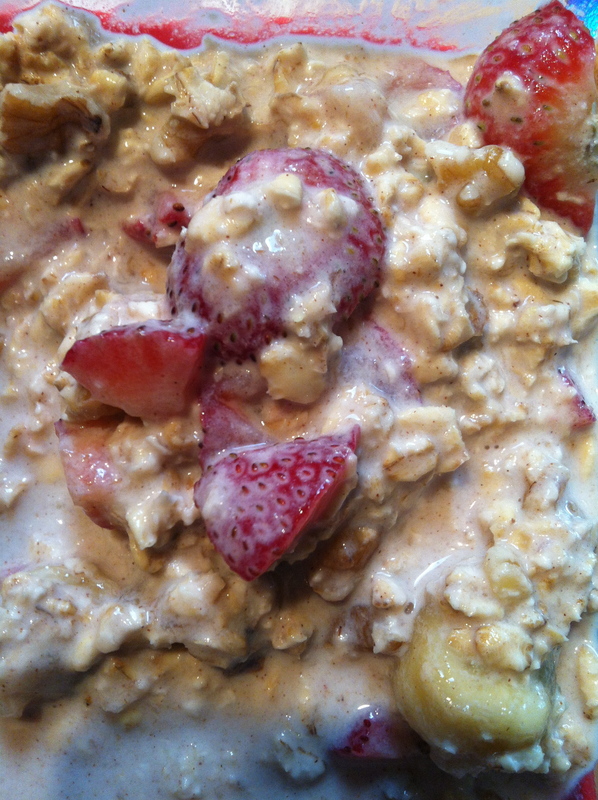 We used apple, strawberries, dairy yogurt and milk, almonds and almond extract. Delish! Sounds great! I haven’t seen blueberry coconut milk! !